to take card payments virtually anywhere. In the past cash and cheques were the only real ways for many businesses to take payments from their customers. With the spread of card payment terminals, this became easier for some, but those without a single fixed location were still left out. With portable credit card terminals, now almost all companies may reap the benefits of card machines. People no longer carry much cash, expecting rather to pay with credit or debit cards. Hardly anyone pays by cheque any more, and indeed, they are being phased out. If you fail to offer customers the convenience of paying by card they will have to leave your shop to get cash, and may simply decide not to come back. 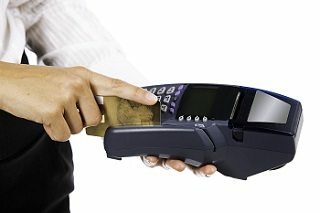 Card terminals also relieve you of the burden of dealing with a lot of cash, giving you extra security and making you less vulnerable to theft. If you conduct business in your clients’ homes, portable terminals allow them to pay with credit or debit cards. You do not have to wait for them to run out and get cash, and you will often be able to add on extra services that were not requested before you visited. These benefits accrue to plumbers and other tradesmen, hairdressers and beauticians, and even vets and dog groomers! If you visit trade shows with your business then carrying a terminal could vastly increase your takings, especially with those impulse purchases that could be made by passing traffic. Mobile businesses often find portable credit card terminals to be essential. For example, taxis may have a fixed place of business but they need the portability that portable terminals offer. If you operate a stall at a farmer’s market or a craft fair then you may well move your location from week to week or even day to day. With a portable card terminal you can still take card payments no matter where you are.